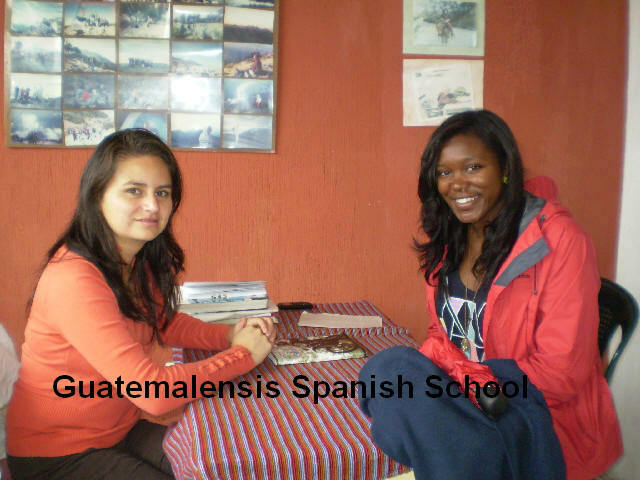 Why study Spanish at Guatemalensis? 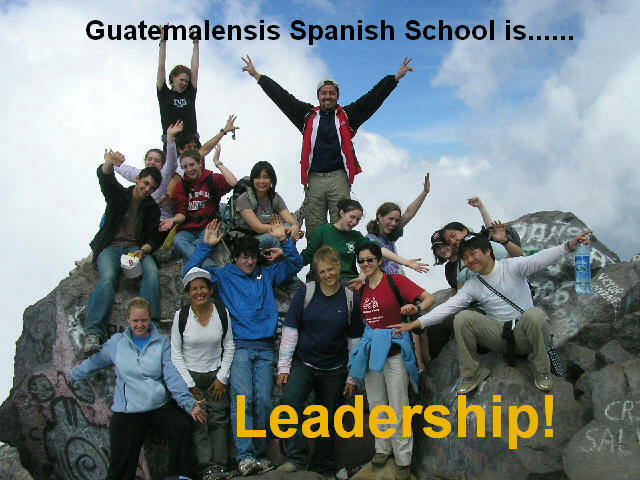 Because Guatemalensis Spanish School is a complete, safe, authentic, integral, ethical, motivating, dependable, successful, professional, dynamic and human school and program. Study, Learn, Practice and improve your Spanish language in connection with the culture with safety. 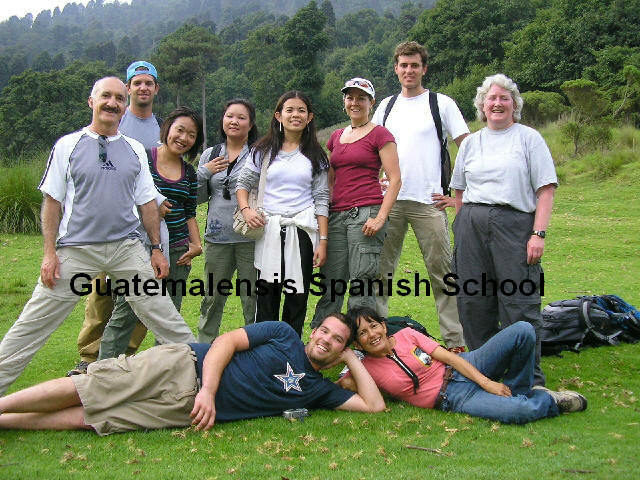 Guatemalensis Spanish School is located in Quetzaltenango, (known as: Xela) in the western highland of Guatemala C. A. and wants to give you the welcome to learn a new and useful language through a wonderful experience with us. If you want to travel in Latin America and are interested in a good quality total-immersion in the language and a safe studyabroad experience, GSS is the school abroad you're looking for! Highly motivated students and teachers! You know the incredible rewards of learning a foreign language!... Better business, smarter and more rewarding vacations, new career and job opportunities, to be professionally competitive, to obtain stability, more productive travel time, new friendships.......Whether for travel, business, study or entertainment, conversing in a foreign language will open up whole new worlds to you, and now Guatemalensis Spanish School makes learning the Spanish language simpler and faster than you ever thought possible!....The best of our experience in Spanish language teaching for you!......and because you don't want to lose your time and money! Our Program is designed to build the proficiency from beginner to intermediate and to advanced learners of Spanish. Learning a language is a lifelong journey enhanced by goals, openness to new experiences and cultures, and knowledge of your unlimited potential. It is made up of many possible directions and strategies that can be learned and implemented in numerous ways. 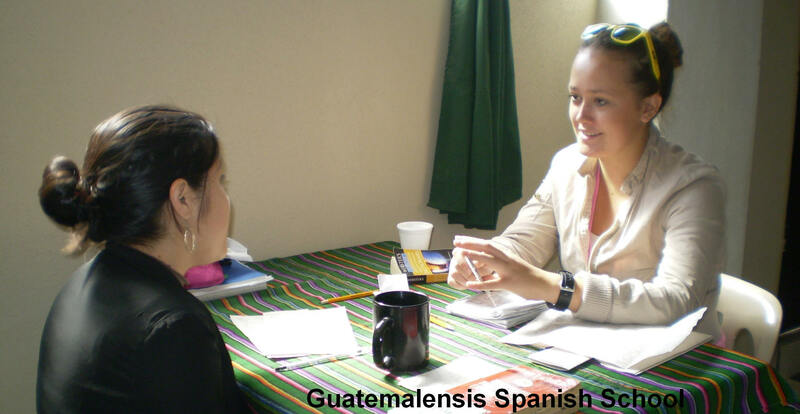 By personalizing and combining successful strategies and the activities in Guatemalensis Spanish School, students can build advanced communicative proficiency, gaining the tools and confidence needed for a lifetime of language learning. We will be building your listening, reading, speaking, writing, grammar, vocabulary and cross-cultural skills. The GSS Full Immersion Program permits you to obtain a learning of the Spanish Language of excellent quality, to be fluent in your new language, and to deeply grasp its grammar. Besides, you get to know the real Guatemalan and Latino Cultures and lifestyles. Language study and Culture Immersion will quickly improve your skills to communicate with fluency. With our experience, methods, techniques, and materials, we guarantee that you will develop and improve your writing, oral, reading, and comprehension abilities. In GSS, if you are self-motivated to learn and if you are ready to study, with our system, learning Spanish is very easy. According to the school's policy, at the end of your studies you will take a written and/or oral exam to evaluate your progress. Also, after completing our comprehensive program, you WILL speak, write, understand and communicate at a very good level of Spanish. At the end of your studies you will receive a signed and stamped Certificate and a Diploma of Spanish as a Foreign Language. Besides to teach to former students that want to master the language, we can teach to travellers that only want some basics of the language for enjoy more their travel. Many times we experience that the students fall in love with the language and culture that continue studying more. In our methodology, we use the personalized system of teaching, one student per one teacher, from beginners to very advanced students, so, you will be learning according to your objectives, interests, desires, personal level, etc. and based on a program and plan. One of the most practiced areas is the conversation as the basis of the communication. We don't rotate our teachers every week to ensure the continuity of the student's learning and to avoid waste of time by having to start over each week. All of our teachers and administrative staff are graduated from fields of teaching and education. Beginner (Sub Levels B1, B2, B3) In this level our program will enable you with the enough knowledge and practice of the language to allow you to perform in situations which require a basic and elementary use of the language. Intermediate (Sub Levels I1, I2, I3) In this level our program will enable you with the necessary knowledge and practice of the language to allow you to communicate in every day situations which don't require specialized vocabularies. Advanced (Sub Levels A1, A2, A3) In this level our program will enable you with the advanced knowledge and practice of the language to allow you to communicate in all situations which require specialized and advanced use and knowledge of the language and vocabularies in a cultural basis. Our methodology makes emphasis on the developing of many language skills such as: Grammar, Vocabulary, Writing, Reading, Speaking, Listening, Conversation, Pronunciation, Understanding, Redaction. We have at GSS a lot of different books for learn Spanish, learning materials, the best Spanish grammar texts, workbooks, literature for all levels: Beginner, Intermediate, Advanced students, for Spanish Professors and also our own text book guides, developed by our professional staff and team of teachers. Also students can use their own books and materials. We recommend that you bring a good Spanish-English dictionary, ideally a University of Chicago pocket size edition. Stationery supplies are available in bookstores here so you need not bring them with you. 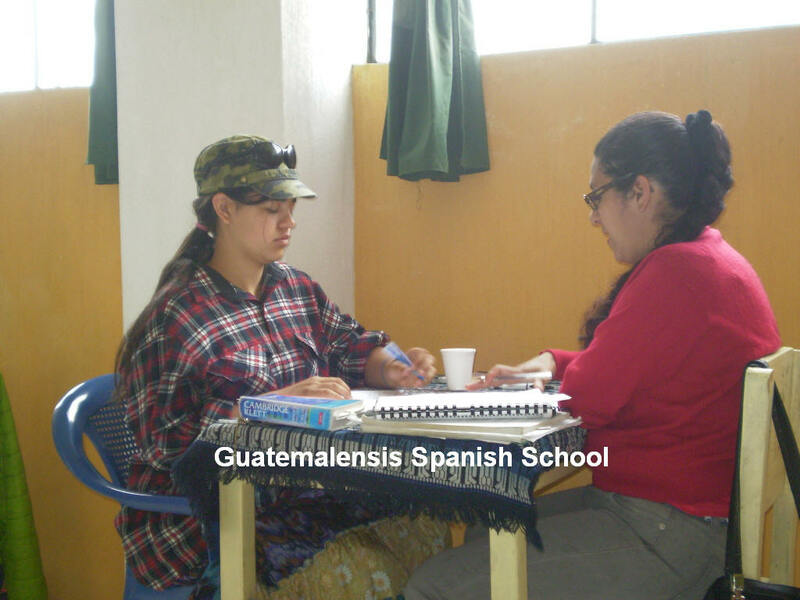 My experience with Guatemalensis Spanish School was very enriching. The directors are extremely helpful and fun, and I learned so much Spanish in so little time. I especially enjoyed the excursions the School organized in the afternoons and on the weekends. They took us climbing up volcanoes, hiking down into lagoons, bathing in steam baths, etc.. I'm very satisfied with my experience at Guatemalensis! Kelly Folliard, U.S.A. COPYRIGHT ©1990-2020 GUATEMALENSIS SPANISH SCHOOL. GSS, Xinka Tours, spanland, www.spanland.com. All rights reserved.